The works listed here are useful for further research or visualization of the items described. Only the most important or most widely available sources are listed. Catalogs of manufacturers or retailers of both guns and equipment are also very good and usually highly detailed sources. These can often be ordered for free or a small charge, or downloaded from the Internet. The following books provide useful real-world information on the equipment described in this book. Dockery, Kevin. Compendium of Modern Firearms (R. Talsorian Games, 1991). Written for gamers, the Compendium is very useful, with well-researched data on many weapons. Owing to the year of publication, it is a bit outdated. Gander, Terry (editor). Jane's Infantry Weapons 2001-2002 (Jane's Information Group, 2001). Annually published virtual one-stop resource for infantry weaponry. Incredibly useful tome with hundreds of entries, but very expensive. Check your library. Older issues as well as Jane's Ammunition Handbook, Jane's Personal Combat Equipment, Jane's Police and Security Equipment, and the periodicals Jane's Defence Weekly and Jane's International Defence Review are also helpful. Gray, Randal, and Harding, David (editors). Weapons: An International Encyclopedia from 5000 B.C. to A.D. 2000, Revised Edition (Diagram, 1990). While it only depicts some of the specific designs in this book, this encyclopedia is a great resource for explanations on how weapons, ammo, and equipment in general work. A must-have for any gamer's library. Hogg, Ian. Greenhill Military Manuals (Greenhill/Stackpole, 1994-2001). 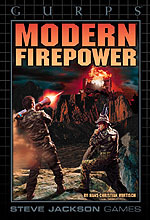 A loose series of small books on topics such as Ammunition, Counter-Terrorism Equipment, Infantry Support Weapons, Small Arms: Pistols and Rifles, Submachine Guns, and The World's Sniping Rifles. Generally good information and illustrations. Hogg, Ian. Military Small Arms Data Book (Greenhill/Stackpole, 1999). Essential data on small arms from 1870 to 1999, quite complete, but with few illustrations. To be used with other sources. Hogg, Ian. Jane's Guns Recognition Guide (HarperCollins, 2000). A very handy pocketbook, much cheaper than other Jane's, while providing enough information for most game situations. Miller, David. Illustrated Dictionary of 20th-Century Guns (Salamander, 2001). Very good value. A neat pocketbook with scores of fully illustrated entries, from handguns to heavy machine guns. Walter, John. Greenhill Military Manuals (Greenhill/Stackpole, 2000-2001). Also part of the above-mentioned series, superior in some regards to Hogg's books. 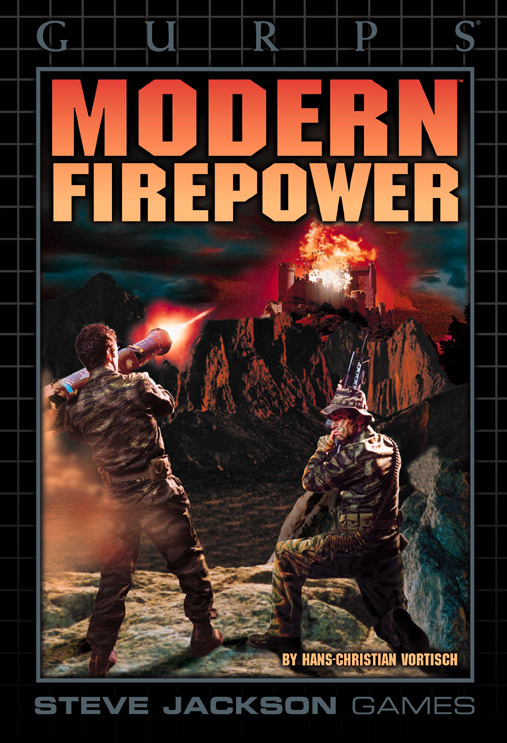 Currently includes Modern Machine-Guns and Modern Military Rifles. The following films have been selected almost solely on basis of their display of modern firearms described in this book . . .
Aliens (James Cameron, 1986). See a less sophisticated variation on the OICW concept in action. A popular image of future warfare (without most of the modern electronics), and dead cool. Demolition Man (Marco Brambilla, 1993). The futuristic beam weapon (!) that villain Simon Fenix steals from the museum is a H&K G11 prototype. Heat (Michael Mann, 1995). For the bank robbery, Neil and Chris use Colt CAR-15A2 R733 Commando carbines, smaller cousins to the M4A1. For the first half of the film, Neil also carries an H&K USP pistol. Some of the LAPD officers are armed with the Colt AR-15A2 R702. Judge Dredd (Danny Cannon, 1995). Judge Dredd's Lawgiver pistol has some of the features of the O'Dwyer VLE SmartGun. Resident Evil (Paul Andersen, 2002). Watch some ineffectual use of H&K G36Ks and MP5KA4s with collimator sights. The team leader also has an AG36 below his carbine, but never gets a chance to fire it . . .
Les Rivières Pourpres (The Crimson Rivers) (Mathieu Kassovitz, 2000). Inspector Kerkerian carries a Glock 26. Ronin (John Frankenheimer, 1998). Sam uses a SIG SG551 and H&K HK69A1 Granatpistole during the ambush in La Turbie, and later a FN MINIMI-Para with retractable stock. The Nice SWAT team fields the Franchi SPAS 15. Bad guy Seamus is armed with a Kel-Tec P-11. Tomb Raider (Simon West, 2001). See the H&K G36KE and UMP (both with suppressors) and Walther P99 in the hands of the bad guys, as well as Lara Croft's own H&K USP Match pistols. Tomorrow Never Dies (Roger Spottiswoode, 1997). Bond first handles a Walther P99: "Ah! The new Walther. I asked Q to get me one of these."